Defining the appropriate primary key and unique constraints is fundamental for a good database design. 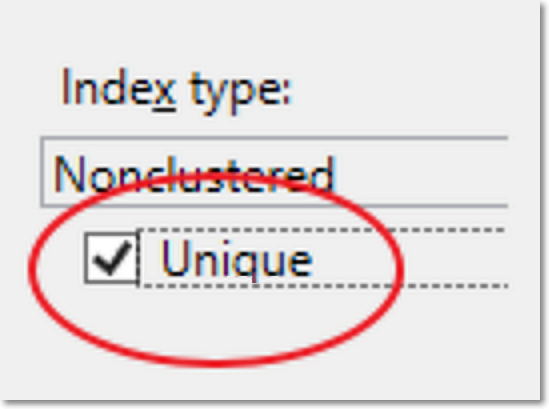 One thing that I often see overlooked is that all the indexes with a key that includes completely another UNIQUE index’s key should in turn be created as UNIQUE. You could argue that such an index has probably been created by mistake, but it’s not always the case. You may wonder why you should bother making those indexes UNIQUE. The answer is that constraints help the optimizer building better execution plans. Marking an index as UNIQUE tells the optimizer that one and just one row can be found for each key value: it’s a valuable information that can actually help estimating the correct cardinality. Does the script return any rows? Make those indexes UNIQUE, you’ll thank me later. Posted on January 29, 2014, in SQL Server and tagged constraints, database, indexes, SQL, SQL Server, SQLServer, unique. Bookmark the permalink. 1 Comment.